Someone to Tell It To relies exclusively on donations to provide its services. We want to make those services available to everyone, regardless of their ability to pay, knowing that this will enable more people to reach out for and receive support and guidance. Your contributions enable you to be partners with us in providing hope and healing. We wanted to start 2019 with a whole heart. With your help, we’re already there. 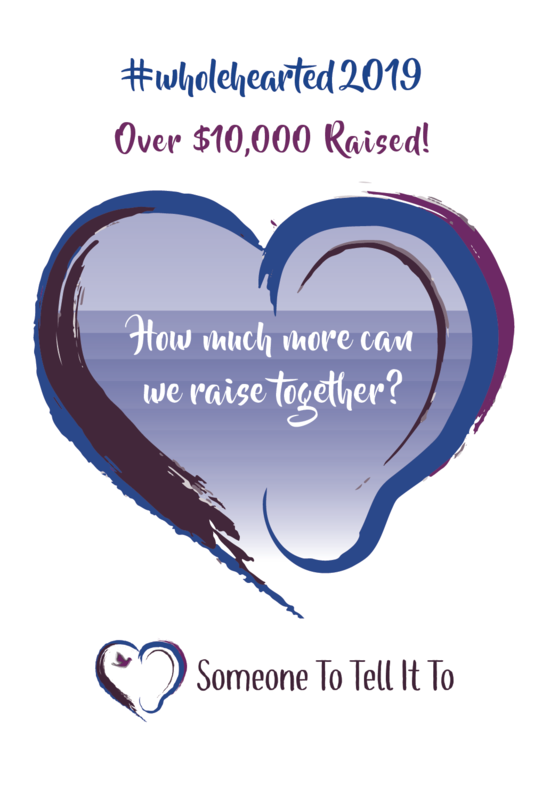 We had a goal of raising $10,000 by the end of 2018. Your generosity helped us reach that goal in record time! Now, we’re on a mission to see how much more we can do together by year end. Your gift of any amount will help us start the new year even stronger! GuideStar, the world’s largest source of information on non-profit organizations, has awarded Someone To Tell It To the Gold Seal of Transparency. Because all of our work is done in pairs, one hour of compassionate listening costs the organization $150. Thanks to our GuideStar rating, you can be sure your donation is being used wisely to fund more compassionate listening for people in need. You are making moments like these possible for the people we serve.